The only quality of my yellow Letort hoppers I’d like to improve upon is buoyancy. 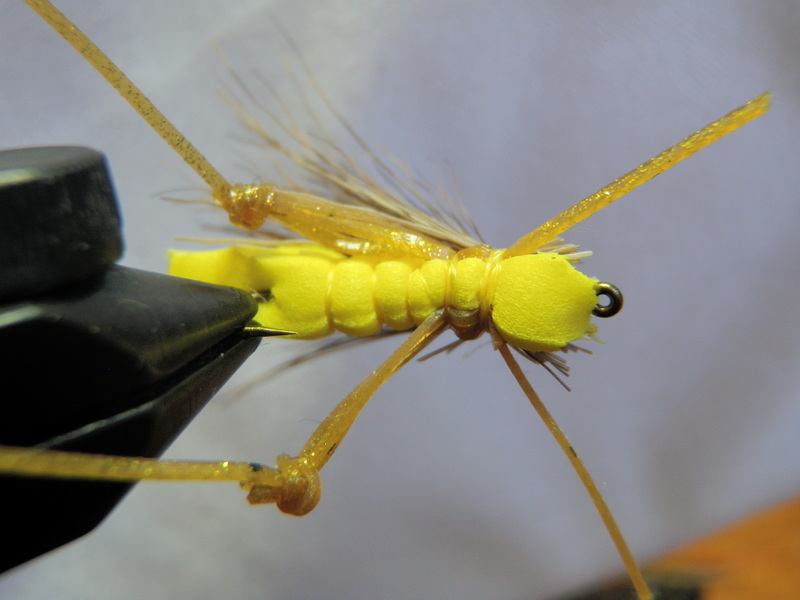 Last winter I tied some Charlie Boy Hoppers made from foam in an effort to discover a buoyant attractor fly that would suspend beadhead nymphs, be highly visible, and remain on top of the water without vigorous false casting. I made some tan and yellow Charlie Boys and gave them a try. I had my best success on the Conejos River using the tan versions; however, the deer wing disintegrated after catching two fish. This was actually the best performance as the yellow ones that I used on the Arkansas River early in the season came apart simply from repeated casting. 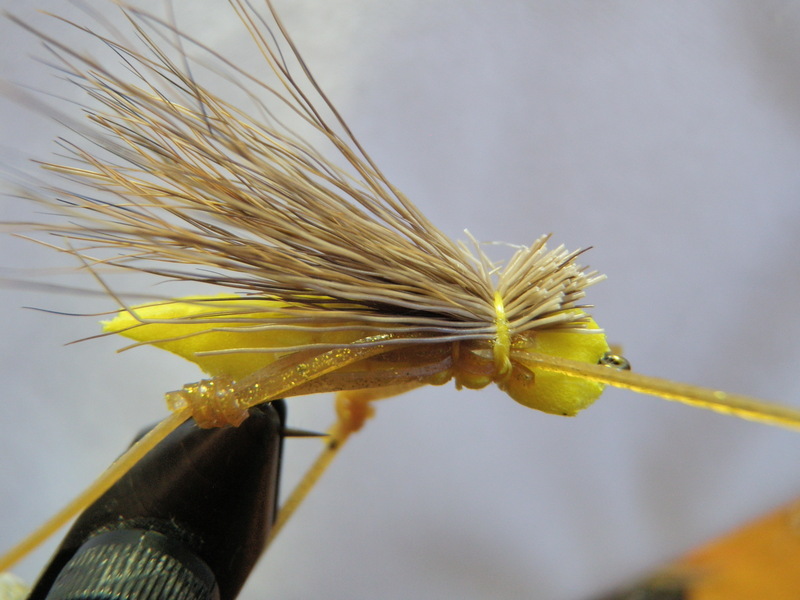 In short these flies were poorly tied, and I reverted to the reliable yellow Letort hopper. Jane bought me the fly tying book by Charlie Craven, the creator of the Charlie Boy Hopper, for my birthday so I decided to review the instructions. The materials list suggests using 3/0 thread instead of the standard 6/0. 3/0 is a stronger heavier thread that enables more pressure to be applied when tying down materials. Another change was the addition of hopper legs made out of rubber strands tied in a knot to simulate the bend in the large legs of a grasshopper. I decided to give the Charlie Boy Hopper another try. 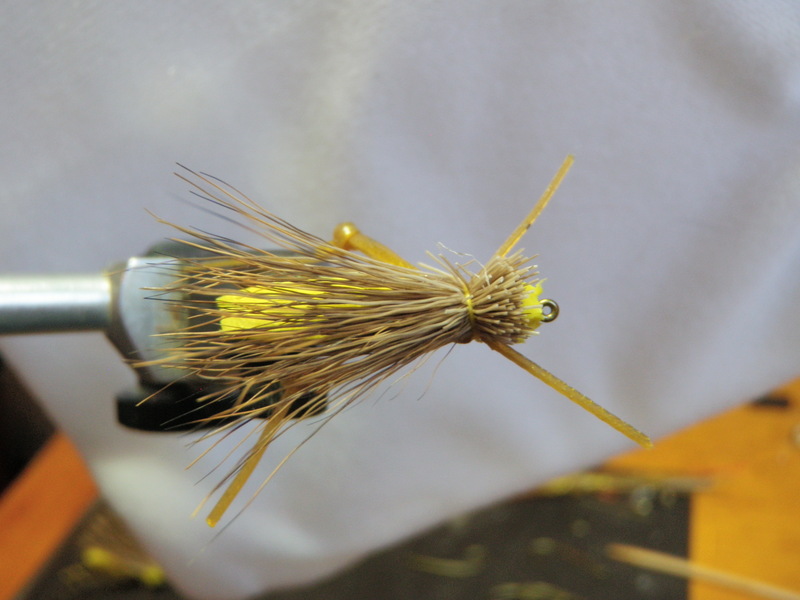 I tied 20 using yellow foam bodies and four using tan foam. I have quite a few carry over tan versions, and I discovered I was able to refurbish four bodies with missing wing material by attaching my thread near the head and tying in a new wing. I covered the top of the foam at the wing tie in point with clear nail polish and then cinched the thread down hard so that it was embedded into the foam. This flared the deer hair wing nicely and provides a very solid bond between the hair and the foam. I’m optimistic that these improvements will make the Charlie Boy Hopper a solid producer during 2012. The rubber hopper legs also add realism and movement, so that should enhance the productivity as well.